Lockley, T. (2011). Pre-university experience of ICT and self-access learning in Japan. Studies in Self-Access Learning Journal, 2(3), 182-194. Information and Communications Technology (ICT) can play a key role in self-access learning and the organization of self-access centres (SACs) (Reinders & Lázaro, 2007). The generation of young people currently at university has been labeled “digital natives” (Prensky, 2001), yet it would seem that many of these “natives” in Japan seem to lack the necessary ICT skills to use in the university context (Castellano, Mynard & Rubesch, 2011; Williams, 2011). This paper assesses the current situation of Japanese young people’s pre-university ICT experience and its implications for self-access learning. Do they actually lack the necessary skills to engage with self-access in an ICT context? Or does the reality in fact show that this perception is wrong and if so why? This paper will answer the questions through original research (N=105) and reference to the literature, globally and in Japan. It finds that students have more competence than previously believed and ventures some reasons for this previous misperception. As Information and Communications Technology (ICT) can play such a key role in self-access language learning, self-access centre (SAC) educators in Japan need to know what experience their students have had with technology and its implications for the self-access sphere. This will aid in curriculum planning, construction of web based learning platforms, student communications, publicity, and capital purchases, thus facilitating a more efficient, accessible and beneficial self-access environment. The students currently attending Japanese universities are very much what Prensky (2001) would call “digital natives”, a generation of young people surrounded by and dependent on ICT. Many educators in Japan would question the term “digital natives” here however. There seems to be a wide-spread belief that young people lack ICT knowhow (Castellano, Mynard and Rubesch, 2011; Williams, 2011). Without delving deeper in to the situation, one might be forgiven for agreeing. For example, an informal survey prior to this research revealed most students believed they didn’t know how to use seemingly common programs such as Microsoft Word and PowerPoint; some appeared to struggle to access the internet. This is in fact in line with current international research which shows that until recently, there has been little empirical evidence to support the “digital natives” theory (see for example Bennett, Maton & Kervin, 2008; Brown & Czerniewicz, 2010), and many of Prensky’s (2001) claims have been attacked as misleading, simple assumptions or crude generalizations. Some researchers have even called the term offensive, an “attempt to force western norms, beliefs, attitudes, and cultural values” (Brown & Czerniewicz, 2010, p. 359) on the rest of the world. However, “digital natives” or simply people who have grown up in the first years of this increasingly web-based century, young people coming through Japanese tertiary institutions are certainly no strangers to technology. All of them own and use mobile phones and I-pods on a daily basis (Takahashi, 2011), and there is little doubt that today’s young people “have been exposed to technologies never before seen” (Nasah, DaCosta, Kinsell & Seok, 2010, p. 550). Bennett and Maton (2010, p. 329) write “it will continue to be important to measure access and activity through […] surveys [to provide] a more sophisticated, rational debate that can enable us to provide the education that young people deserve” and we “must consider data-driven evidence showing who these students are in total when developing ICT policy” (Nasah et al., 2010, p. 550). The research presented here will provide a snapshot of how 105 first year Japanese university students have interacted with technology in their pre-university lives with the aim of enabling educators, in particular SAC staff, to make decisions about purchasing, ICT developments and how best to use the information presented in this paper pedagogically. 1) What pre-university experience of ICT is present in Japanese students? 2) Why might this experience not be manifesting itself in the classroom? The “digital native” debate has not escaped Japan. Takahashi (2011), reports on a whole youth society and culture, oyayubibunka, or ‘thumb culture’, based upon mobile phones with 3G capability. The term “digital native” itself has even been modified to “kei-tai (mobile) natives” (p.9) to suit the particular Japanese context, thus making the point that ICT experience of Japanese youth is primarily mobile phone focused . “80% of elementary school users and almost 100% of […] high school mobile users have access to the internet via their mobile phones” (p. 12) and use it incessantly. Takahashi describes a typical teenage “kei-tai native” girl’s day. The phone is never off, even whilst sleeping and in school (where they are supposedly banned). She uses her mobile for email, social networking, music, Youtube (largely replacing television) and even does her homework on Skype with friends (Takahashi, 2011). Supporting this picture of online socialization, Akimoto, (2011) writes that 20% of the Japanese population is on Twitter and Japanese language tweets account for 14% globally. For Takahashi, this constantly connected life creates a personal space for teenagers outside the constraints of school and home, and a close community, with rules and hierarchy, almost harking back to rural village life. The Japanese Ministry of Education, Culture, Sports, Science and Technology (MEXT), states that the purpose of ICT in schools “is to promote computer literacy in students in order to develop their abilities to participate in a society that is information oriented” (MEXT, 2006). In 2002/3 a new Course of Study (non-binding but recommended government guidelines for schools) was promulgated, introducing a new curriculum area called “Information Studies”. In senior high school information studies has three strands, A, B and C (MEXT, 2006) and schools should offer at least one of them. Information Studies A concentrates on basic ICT skills such as word processing, spreadsheets and PowerPoint. B involves the scientific side of computing, including hard and software, operating systems and network functioning. C deals with social issues and computing, including ICT’s role in business, government and the social services. MEXT aimed to have high speed internet connections in 100% of classrooms by March 2011 (MEXT, 2006). Maybe this curriculum is paying off, as a recent OECD study found that Japanese first year senior high school students are now ranked fourth globally, after South Korea, New-Zealand and Australia, for ICT competence (Kyodo, 2011). Seemingly contradicting Takahashi (2011), who believes that Japanese youth have some of the highest levels of digital literacy in the world, others find that this supposed literacy does not transfer to the digital sphere at university well. Williams (2011) writes that initially students had a lot of issues such as not knowing how to turn on hardware, change volume, save to USB and use more than the simplest Microsoft Word functions. She conversely found that most claimed they were “comfortable” with using a PC and Word. Indeed 100% used computers at home, 60% surfed the Internet and 20% used PCs for homework. These findings are in line with those in other parts of the world such as (Nasah et al., 2010) who also reported high levels of social and online skills, but lower academically transferable ones. The pedagogical potential of ICT in SACs is clear. Given the potentially non- fixed-space nature of self-access and autonomous learning, “discussion groups and lists [now often replaced by Web 2.0 applications] can potentially perform a very useful function in creating a sense of continuity and in bringing students together” (Reinders & Lázaro, 2007, p. 128). SACs that are “largely commensurate with principles of flexible learning and chat facilities could be used to make learning opportunities and support more widely accessible” (Reinders & Lázaro, 2007, p. 128). On the practical side, resources placed in a virtual learning environment such as ‘Blackboard’ or ‘Moodle’ allow students to access material from any location and at any time. This also reduces the potential for materials to be misplaced or damaged (Chia, 2005). However, participants in Castellano et al.’s (2011) research tended to use computers in the SAC for social networking, Internet surfing (especially news), and software-based language learning. For some students the SAC was a primarily social space, and they felt that they did not need computers to socialize with other users. Reinders and Lázaro (2007, p. 129) conclude that the main challenge for SACs “seems to be a pedagogical one of finding meaningful uses for technology, not as a new tool for old tasks but as a means to implement new pedagogies”. They found however that in fact technology use for pedagogic functions in SACs around the world was subject to a lot of variation, with only a few facilitating online materials delivery of the sort that they and Chia (2005) advocate. Even the top ten of the 45 institutions surveyed by Reinders and Lázaro (2007) were limited in their range of technology usage, and only one offered a large variety of options. Most of the 45 centres surveyed used technology for communication and administrative purposes only. Few centres made full use of the clear potential that technology offers for learner autonomy. Castellano et al. (2011) found that while the SAC they studied lent over 300 items per day including books, magazines, music CDs and DVDs, students borrowed only 65 pieces of software in a whole semester. This study employed a mixed method data collection online survey with Likert and open-ended supporting questions. The two types of questions were designed to provide complementary information to acquire “in-depth insights into the basis for […] access and activity and what they mean in the lives of individuals” (Bennett & Maton, 2010, p. 329). The survey was based on Langdon’s (2011) findings and his research into learner attitudes to the use of technology in EFL classrooms. Langdon based his interviews on initial research into the student (N=52) use of and attitudes to vocabulary learning software. This was followed by a study of the individual interactions with technology of 6 students over the course of one week. The students kept a log of all their interactions with technology and were then interviewed by the researcher. The data were collected from 105 first year students at a foreign language university in Chiba City. Exactly 2/3rd (n=70) were female. The questionnaire comprised 20 questions, 8 of which have been used as data for this paper. Questions five and seven use a continuous data scale to provide measurable categories and restrict the data to analyzable portions. Questions six and nine collect nominal data to establish clear percentages. It was administered on SurveyMonkey.com and questions were in English and Japanese and students could respond in either language. To create the tables below, responses were converted into percentages, and rounded to the nearest whole number. This provides a clear picture and enables comparison of the figures in a straightforward manner. The qualitative comments were classified using thematic content analysis (Glaser & Strauss, 1967). 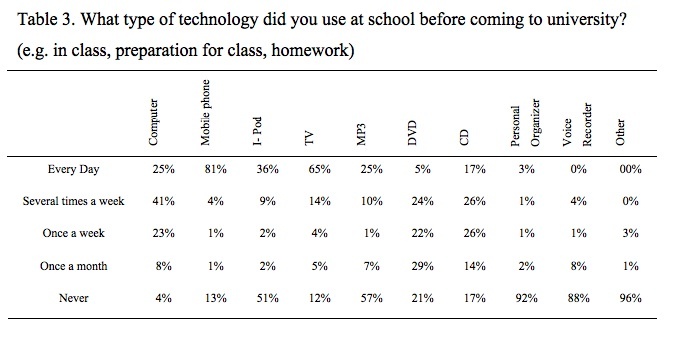 Table 1 shows that nearly all students have computers at home, use mobile phones and posses some kind of music storage/ listening device. These are all used at least several times a week by 96%, 96%, 89% and (combining figures for I-pod and MP3 players) 95% respectively. These devices are virtually universal. DVDs and CDs are used infrequently but at least once a month by the majority of students; 85%, 83% and 66% respectively. Televisions are still regularly used by most participants. Table 2 indicates high usage levels in school prior to university. Predictably the figures increase for the later stages. This is due to the level of schooling as well as the increased proliferation of ICT in schools (the participants in this research would have started elementary school in 1998 and left in 2004 before the new Course of Study was underway). The 51 comments added give more detail. They were again not easily classifiable due to their variety, but two broad strands were identified and the comments below were chosen as typical. Quotation one indicates where programs were taught, simple typing and email at elementary school followed by more complicated applications, PowerPoint and Word, in junior high school, broadly equating to MEXT guidelines. The second quote indicates, that teaching doesn’t always equate to information retention or full understanding. Technology then, as maintained by MEXT, is used as a key component of Japanese schools’ teaching. Students themselves are using ICT outside of school to back up their learning. The 81% who responded they used mobile phones in class on a daily basis was unanticipated, but probably doesn’t reflect educational use as Takahashi (2011) also found. It is clear that Japanese households are full of technological appliances, including ICT, and the survey data shows that virtually all the respondents to the survey are both familiar with and possess many different technological tools and are also online outside university. They are furthermore surrounded by technology in other locations such as school. This is not just being used for entertainment, but also for study and has been for many students since they were young children. The proliferation of 3G mobile phones and Twitter accounts is a major point which SAC staff could tap in to when designing web content and making resources available online. Why then the common educator concern about knowledge of and familiarity with ICT? Is the problem in schools? The survey data backs up the literature in showing that technologies of various sorts are used extensively and on a daily basis in schools. 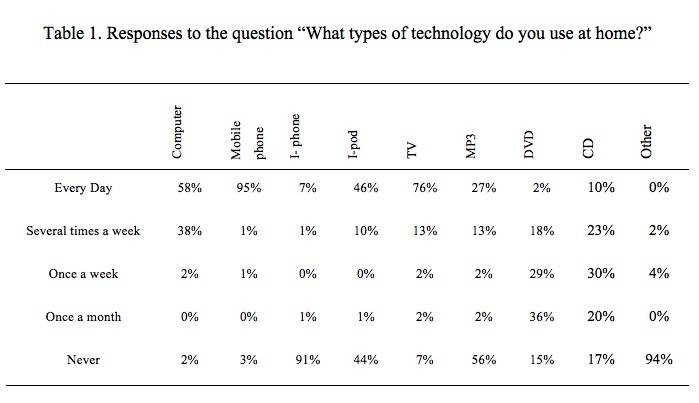 The most commonly used technology was computers, with 89% using these at least once a week. The survey data did suggest that students had learnt about programs such as PowerPoint, Excel and Word, but that some had forgotten how to use them. As the literature shows, ICT use for social purposes does not equal ICT use for task accomplishment. As noted by Bennett & Maton (2010, p. 325), “norms and values may not transfer from everyday situations to academic tasks”. In fact Bennett et al. (2008) found that only a minority of these supposedly “digital native” students were using their Internet skills actively (to create media), and “a significant proportion of students had lower level skills that might be expected” (p. 778). They believe the whole argument about “digital natives” has skewed the debate and conditioned educators to expect more ICT competency than is reasonable, focusing on the technically adept students and neglecting others through assuming they are also as adept. “There is as much variation within the digital native generation as between the generations” (p. 77), something which Williams’ (2011) Japanese study also found. While Nasah et al. (2010, p. 533) write that we quite clearly need to be “more cautious in our views of students and ICT”. Students will clearly not be dispensing with their mobile phones however. Rather, as Takahashi (2011) points out, these tools are central to young people’s lives. Furthermore, Williams (2011) found that although her participants were using computers, they were mainly using them for the same purposes as they would normally use their mobile phone. Only 20% indicated using them for homework. This means that online resources like Twitter and other social networking sites such as Mixi and Facebook (in the Japanese language, not English) will continue to be used widely while more formal ICT applications and skills such as typing or PowerPoint knowledge may be lost. There could be a space here for universities to exploit. Could not the social networking and micro-blogging skills, through careful student training and exploitation of their pedagogical functions, act as a bridge back to ICT skills with more educational and (in the future) professional applications? This would seem especially relevant to SACs and is similar to the findings of Castellano at al. (2011), who recommend, tailoring the materials and ICT facilities in a SAC as close as possible to student needs and abilities. Among this population, there are also socio-cultural and linguistic factors at play. Firstly, the transition between educational institutions can be a traumatic time, and, in the making of new friends, many students may not want to stand out or look too ‘clever’. This may especially be the case in the Japanese context; Aspinall (2006, p. 263) writes that, “in the early stages of learning a subject or skill [students] are also encouraged to be aware of what they do not know” and “it is considered immature and bad manners for the learner to ‘show off ’ something they have learned, or be ostentatious in any way”. It is likely that the participants in this research were willing to reveal more in the context of an individual questionnaire than they wished to show in public. This would account largely for the mismatch in educator perceptions and students’ responses found in this paper and in Williams (2011). Secondly, despite the fact that students are enrolled on EFL courses, it may be their first encounter with English language computers. Although there is no direct evidence in this paper to support this, it seems likely and highly understandable that Japanese schools and households will be operating their computers in Japanese. A Japanese desktop looks very different from an English language one. On first encountering a computer in a different language, anybody, competent or not, “digital/kei-tai native” or not is likely to find it difficult to get their bearings. Furthermore misunderstanding of educator’s instructions due to unfamiliarity with spoken accent, language or teaching style could also be a factor. Thirdly, it is possible that previous schooling may not have equipped these students well enough. Perhaps having engaged with these programs at high school, they did not have the opportunity to actually use them in a real life application, for example as a learning tool in another (non-ICT) subject area. Whether this is the case or not will differ depending on the student and the school they attended and so cannot be more than a hypothesis. Finally, and something that can be attested to with a high degree of certainty due to the fact that any Japanese high school student desiring to go to university must necessarily do this, much of a third year senior high school student’s life is taken up with self-study and revision for university entrance exams rather than taught classes. Because of this it may be that students are able to retain their “kei-tai native” status and general digital competence while forgetting what they have been taught about computer programs such as Microsoft Word or PowerPoint. The fact that students engage in so much self-study may itself have considerable implications for self-access learning in Japan as it may indicate a high degree of familiarity with autonomy, self-discipline and maturity on the part of students which is not generally recognized and students are unwilling to assertively reveal knowledge of. This research was carried out in a private foreign language university in the Kanto area, and as such the results may not be generalizable for the whole population of university freshman students in Japan. No socio-economic data or information on which Information Studies course was followed at senior high school (A, B or C) was collected. This data should be collected in any future survey. A further factor that could be looked at in more detail is ICT use across the curriculum rather than just in Information Studies lessons. The implications of this paper are that although there is a seeming lack of practical ICT knowledge and familiarity among Japanese university intakes, this does not necessarily reflect the reality of the situation. “Digital natives, “kei-tai natives” or not, all students should have had at least basic ICT lessons in school, and virtually all have computers at home though most probably have more experience accessing the internet and using online applications via mobile phones. SAC staff should not shy away from using ICT; they should also not be overly concerned if students appear apprehensive at first as this seeming lack of confidence probably has socio-cultural and linguistic factors at its roots. .
SAC educators and universities want to give their students the best possible education and self-access options. ICT is a key component of this, and large amounts of money are expended on technology of all sorts to facilitate its implementation. This research shows that learning advisors and educators in general should not hesitate to use technology in language learning or to help access SAC resources; rather they should embrace it to further student autonomy, self-confidence and the effectiveness of self-access language education. This research was originally published in a different format and with a different focus in the JALT CALL Journal, April 2011 and can be found at http://www.jaltcall.org/journal/index.html. Thomas Lockley lectures in international communication at Kanda University of International Studies in Chiba Japan. He has worked in Japanese education for five years and also taught French, German and Japanese for four years in UK secondary and primary schools. His research and teaching interests include secondary education, motivation and self-perception. Aspinall, R. (2006). Using the paradigm of ‘small cultures’ to explain policy failure in the case of foreign language education in Japan. Japan Forum, 18(2), 255-274. Bennett, S., Maton, K., & Kervin, L. (2008). The ‘digital natives’ debate: A critical review of the evidence. British Journal of Educational Technology, 39(5), 775–786. Bennett, S., & Maton, K. (2010). Beyond the ‘digital natives’ debate: Towards a more nuanced understanding of students’ technology experiences. Journal of Computer Assisted Learning, 26(5), 231-331. Brown, C., & Czerniewicz, J. (2010). Debunking the ‘digital native’: beyond digital apartheid, towards digital democracy. Journal of Computer Assisted Learning, 26, 357–369. Castellano, J., Mynard, J., & Rubesch, T. (2011). Technology use in a self-access centre. Language Learning and Technology, 15, (3), 12-27. Chia, C. (2005). Promoting independent learning through language learning and the use of IT. Educational Media International, 42(4), 317–332. Glaser, B. G., & Strauss, A. L. (1967). The discovery of grounded theory: Strategies for qualitative research, Chicago: Aldine Publishing Company. Langdon, C. (2011). Good technology does not necessarily equal good pedagogy – an investigation into the educational efficacy of technology in EFL. Research Institute of Language Studies and Language Education, 21, 21-37. Nasah, A., DaCosta, B., Kinsell, C., & Seok, S. (2010). The digital literacy debate: An investigation of digital propensity, information and communication technology. Educational Technology Research and Development, 58(5), 531-555. Prensky, M. (2001). Digital natives, digital immigrants. On the Horizon, 9(5), 1-6. Reinders, H., & Lázaro, N. (2007). Innovation in Language Support: The provision of technology in self-access. Computer Assisted Language Learning, 20(2), 117–130. Takahashi, T. (2011). Japanese Youth and Mobile Media. M. Thomas (Ed.). Deconstructing Digital Natives. NY and London: Routledge. Williams, V. (2011). Digital divide among “Digital Natives”. Studies in Humanities and Cultures, 14, 78-91.